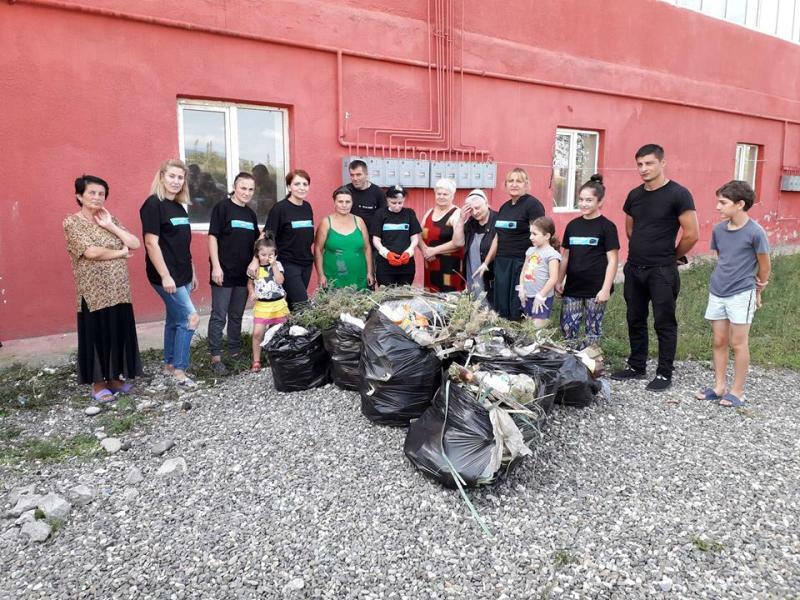 FWE, united in the network – “Now is our time”, joined the campaign “Clean, Healthy World Without waste ” on September 15, 2018. The campaign unites volunteers in 160 countries. 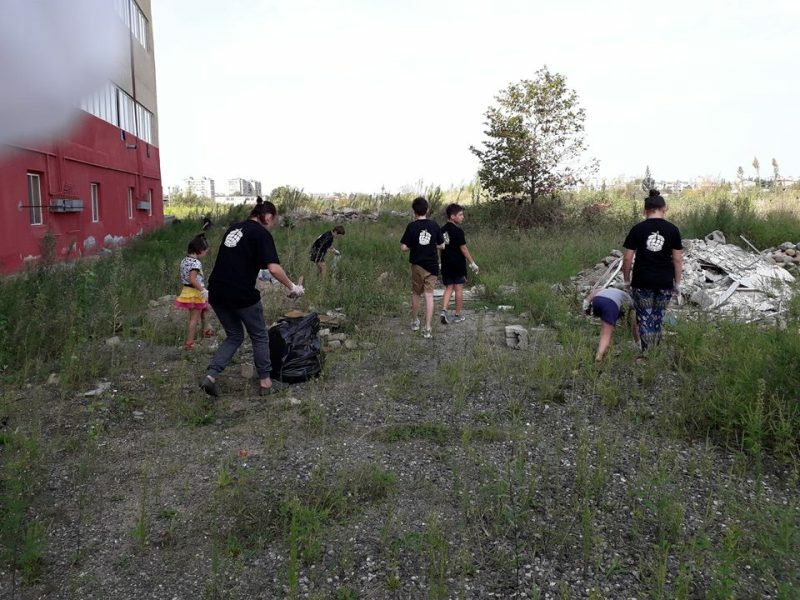 FWE staff and volunteers cleaned up the social housing area, Nickea st. The main message of the demonstration was to support the participation of 5% of the population in the event and to raise their awareness of ecological issues. 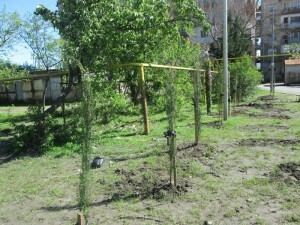 Fund of Women Entrepreneurs (Kutaisi) joins the appeal of the “Green Georgia Movement” / Friends of the Earth-Georgia and the “Youth Union of the Caucasus” in taking an active part in the International Campaign “Clean World” (September 15-16) and the Second International Campaign “World Day purity “(September 15). 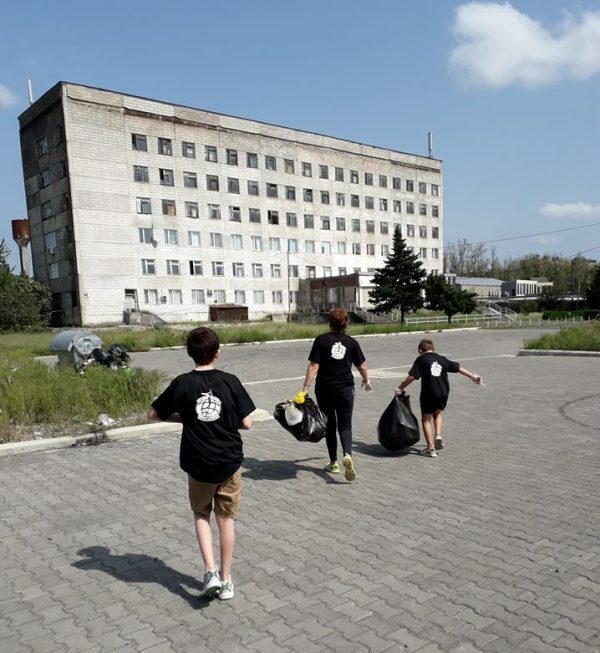 FWE staff join the above mentioned Action on September 15 and will participate in one part of the city (in agreement with the City Hall) during the cleaning process. Within the framework of the Campaign, special T-shirts will be prepared for the staff of the FWE, related to the appeal of this day. FEW along with fund “Philanthropist 2015” held the meeting , within 16days campaign, with public figures of Guria, Poti and Batumi in the central library of Poti on December 1, 2017. 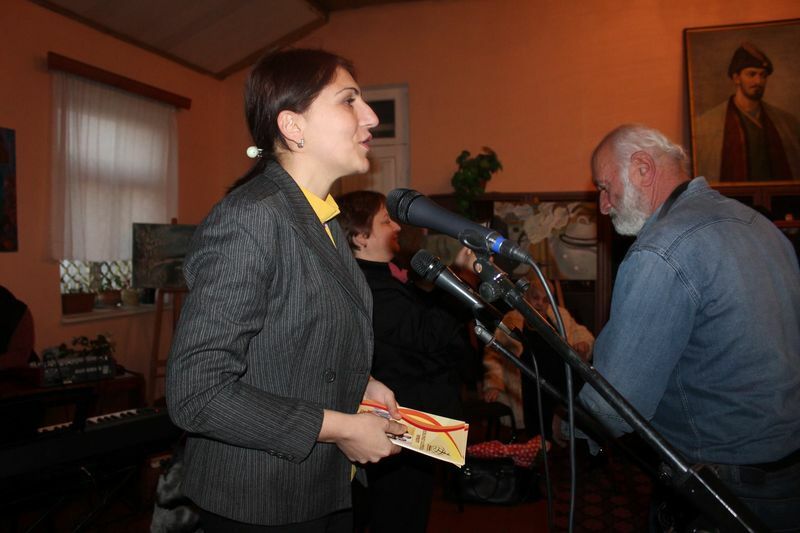 Poets and writers introduced their creations to the audience. 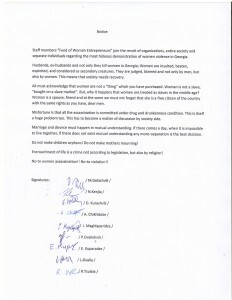 They confirmed with their signature that they condemn violence against women. The action “Together to stop Gender based Violence” was held with the participation of representatives of different social levels in Tsageri municipality on November 29, 2017. Participant men mentioned that ensuring equality of women and men is one of the most important elements of prevention of gender based violence. 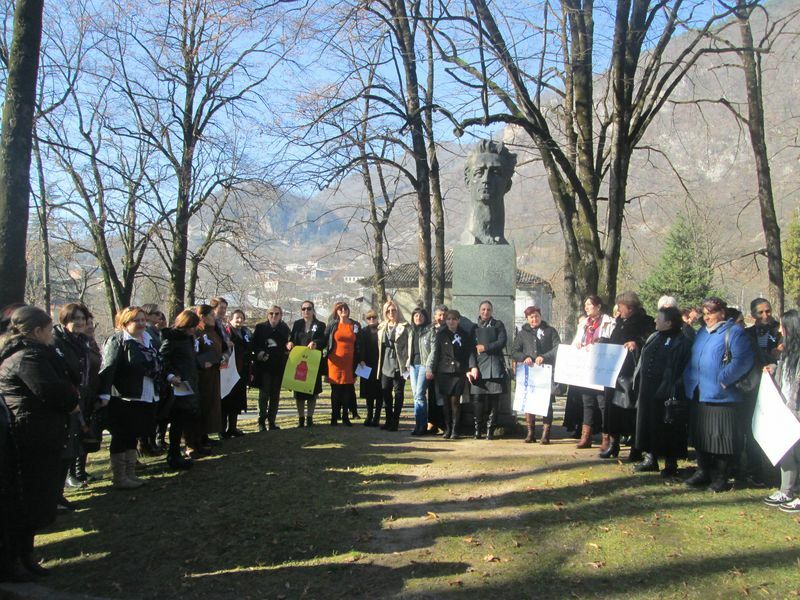 FWE along with other NGOs operating in Imereti region, took part in the action – 16 days of activism against gender based violence – held in Kutaisi Central Park on November 27, 2017. Participants mentioned that uncompromising dependence on each manifestation of violence should be addressed together with the prevention of violence against women. Effective, timely and adequate responses to crime cases must be take. 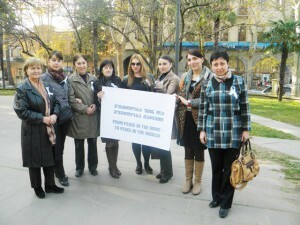 “Fund for Women Entrepreneurs” is joins the 16-day international campaign of violence against women. 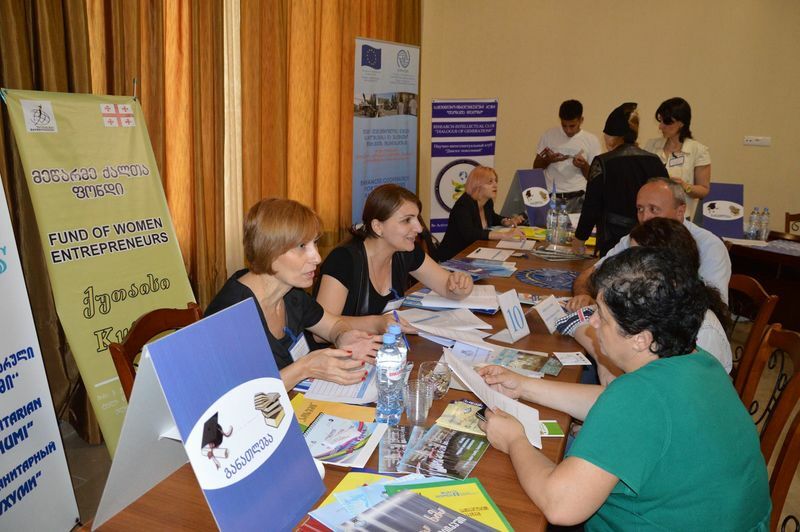 On November 25 in Tsageri’s Municipality the action took place, which was organized by the Center for “The rights of women and gender equality” and NGO Fund of Women Entrepreneurs . 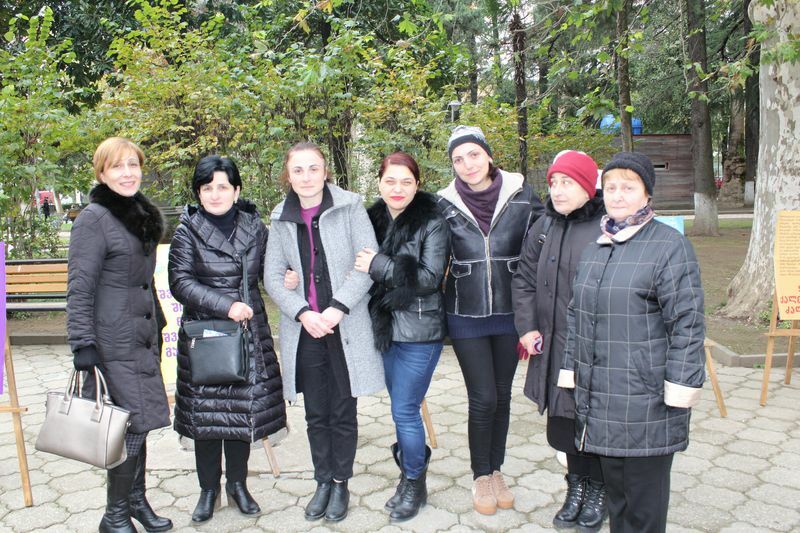 On the share took part: Women from the different villages of Lechkhumi: Chkhuteli, Kveda Tsageri, Gveso, Zubi, Lukhvano, members of Female information group; Production – Organizations and representatives of local self-government. In total 60 people took part. 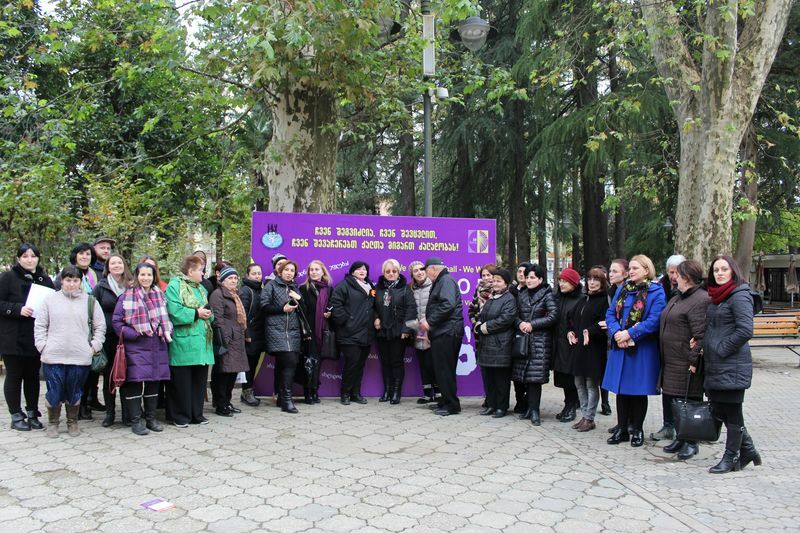 On November 25, 2016 the Fund of Women Entrepreneurs with acting NGO in the Western Georgia, took part in the action “16 active days against domestic violence”. 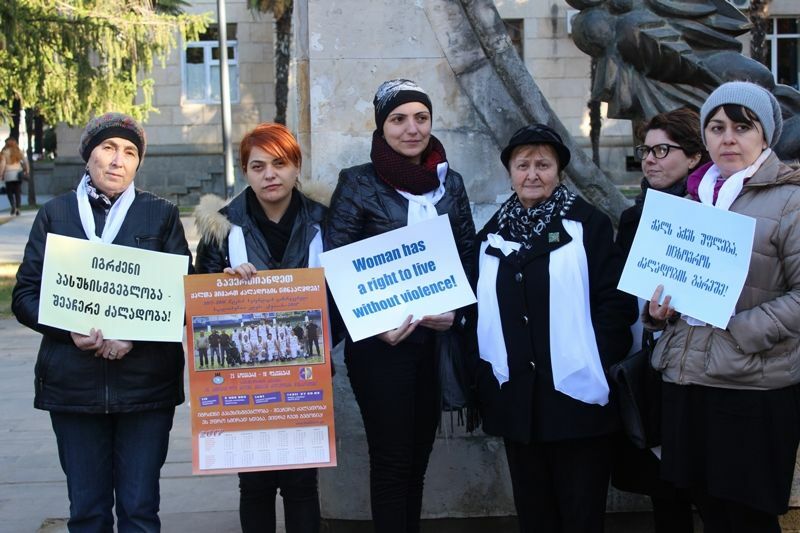 With silent action near the City Hall ,participants called all: citizens, government structures to unite against violence against women and to take effective steps for eradication and prevention of violence. On November 18th, 2016 in Kutaisi, before the Parliament took place the action where took part Fund of Women Entrepreneurs . Implementation: “Creation of efficient inspection of observance of rules on labor discipline”, “Implementation of the principles of policy of green economy”, “Fundamental education reform” and “Completion of repressive drug policy” – participants of the action called to the 9th congress of parliament. They reminded legislators that it is important to review appropriate issues, because time of real changes came. 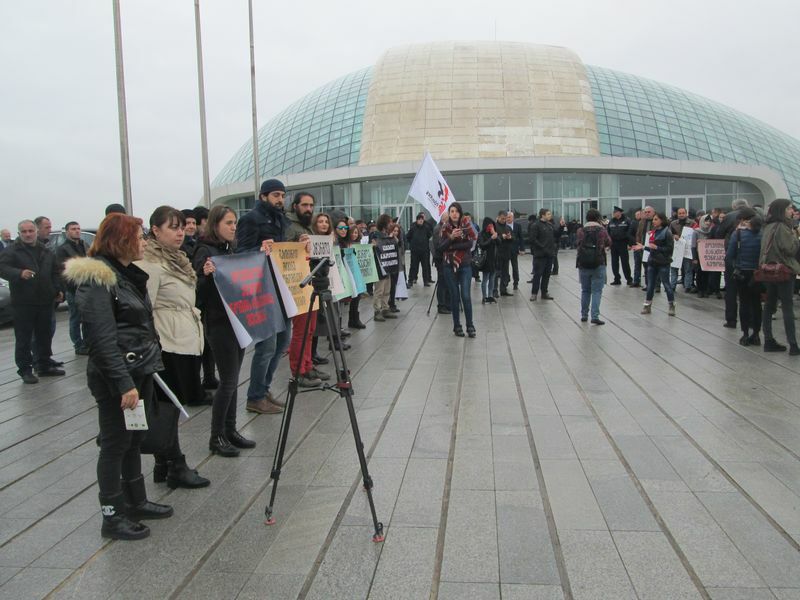 The action was organized by Trade union of Georgia and the local non-governmental organizations. 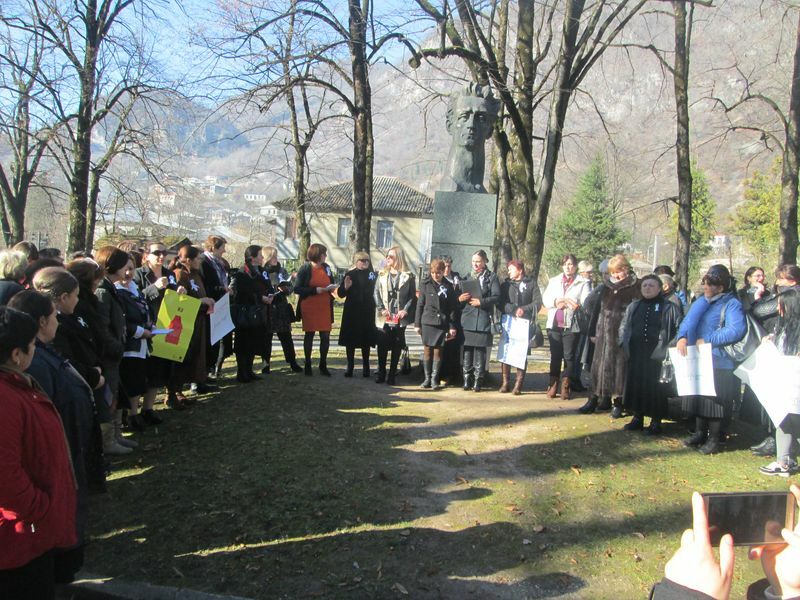 On September 27, 2016 the Fund of Women Entrepreneurs organized an action devoted to Day of Fall of Abkhazia , the pain was divided by beneficiaries of the organizations. 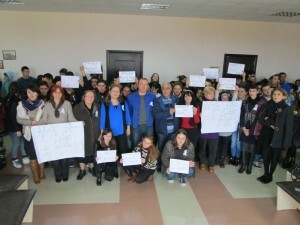 Participants of the action hoped for the kind and peace future and noted that there will come soon the happy day when Georgia becomes united. The fund of women entrepreneurs has participated in an informational forum and has offered visitors the program within the current projects. 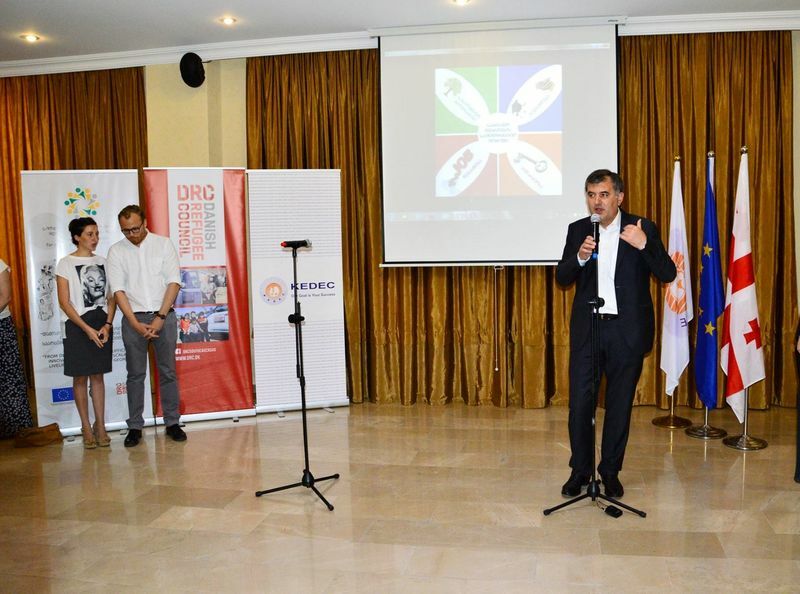 Information forum has taken place on July 21, 2016 in Kutaisi, organized by the “Center of education, development and employment of Kutaisi”. Forum purpose: the offer of the exchange programs performing in the Imereti region, small and medium scale enterprises, government and nongovernmental organizations for IDPs in the area of : employments, professional training, informal education, internship, advanced training. The great interest was caused by the information materials provided by Fund of women entrepreneurs: “Women Schools”(for middle aged women) which purpose is retraining of women and assistance of their employment. The minister of the Ministry of Internally Displaced Persons from the Occupied Territories, Accommodation and Refugees of Georgia Mr. Sozar Subar, representatives of Kutaisi City Hall and deputies of Sakrebulo evaluated the courses as the major factor for improvement and contribution social-economic situation of women. 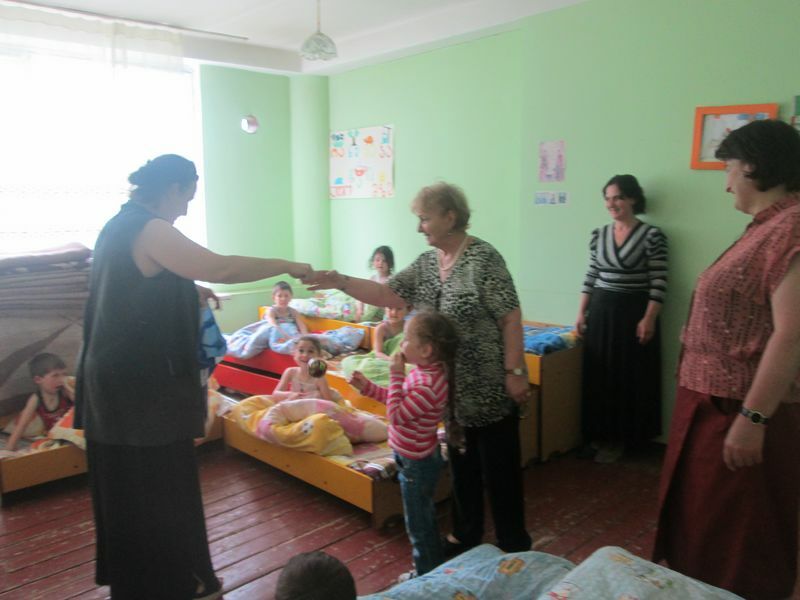 On June 18th, 2016 , activists of the Center of Volunteers at Fund of Women Entrepreneurs delivered toys to children of kindergarten of Tsageri Municipality and have spent one fine day together with them. 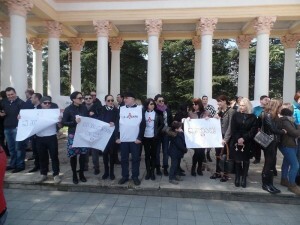 On March 19th, 2016 the staff of “Fund of Women Entrepreneurs” together with other non-governmental organizations ,in Kutaisi has participated in an action – “it affects you too”. 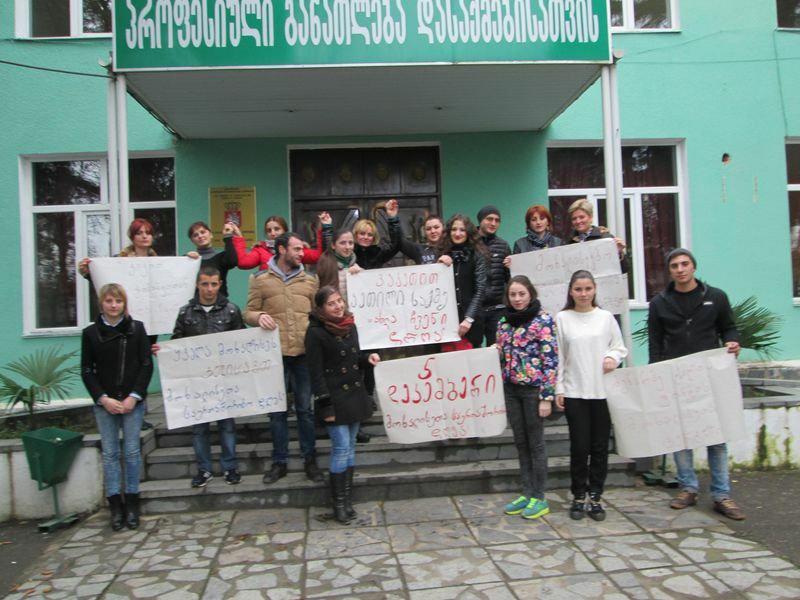 Participants of the action protested showing the episode of private life and have noted that private life is inviolable, and the government of Georgia is obliged to provide protection of this right. 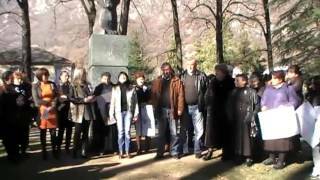 On February 29, 2016, beneficiaries and the staff of Fund of Women Entrepreneur have participated in an action and have expressed the solidarity to Nadezhda Savchenko. On December 8, 2015 an informative meeting was held in a vocational college “Iberia”. 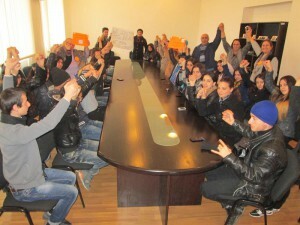 Students said “no” to violence and declared their solidarity to the victims of violence. 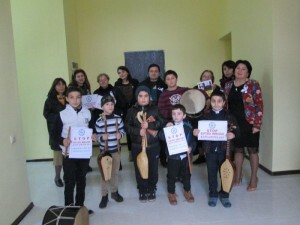 Women Entrepreneurs Fund and Fund “Kvelmoqmedi 2015” in the frame of international campaign “16 active day against the gender violence” held an informational meetings: Poti Vocational college “Lazika”, listeners of “Women’s School” of Poti, Youth and with representatives of Art and Sport. 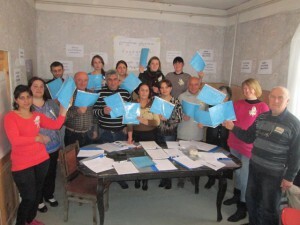 During the meetings, participants got information on domestic violence prevention, protection and amendments in Georgian Law on assistance of victims of domestic violence. They were acquainted with the legal mechanisms, that were implemented by the government in case of gender violence. The meetings were held in questions/answers format. Information received up to 300 people. On november 27,2015 students of Zh. Shartava Public School #6 joined to International Day of gender violence prevention. 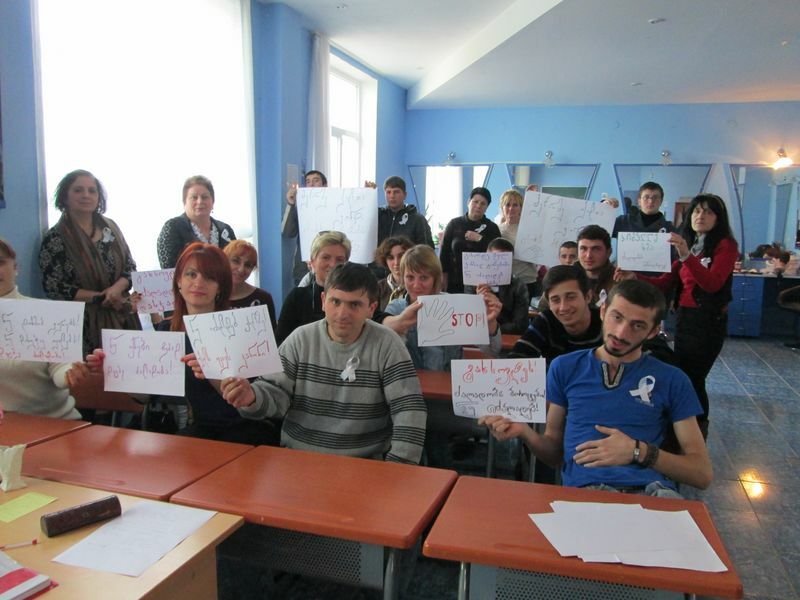 The students-youth and teachers expressed their solidarity to the victims of gender violence and said no to violence . On November 25, 2015, “Fund of Women Entrepreneurs ” together with other non-governmental organizations, began 16-day campaign of elimination of violence against women and started with an hour action . Participants of the action said no to violence against women, declared solidarity to them and called on everyone to unite against violence in order to protect women’s rights . 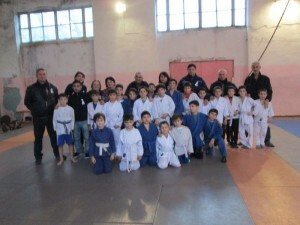 Representatives of different spheres supported this action. 16 апреля 2015 года в рамках проекта сети «Синергия»: «Включение ВПЛ г. Кутаиси в обсуждение и адвокатирование муниципального бюджета 2015 г. с целью учитывания своих специфических требований» _ ВПЛ-жители здания 22-ого д/сада на ул. Никея осуществили рассаду хвойных саженцев, предоставленных Абхазским правительством. 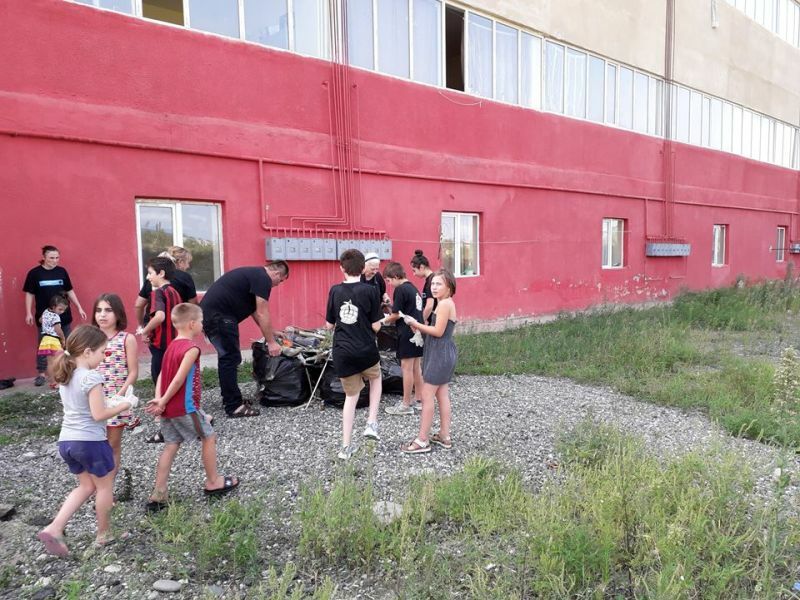 В процессе рассадки на добровольческих началах активно участвовали представители «Фонда женщин предпринимателей» и Абхазского правительства. 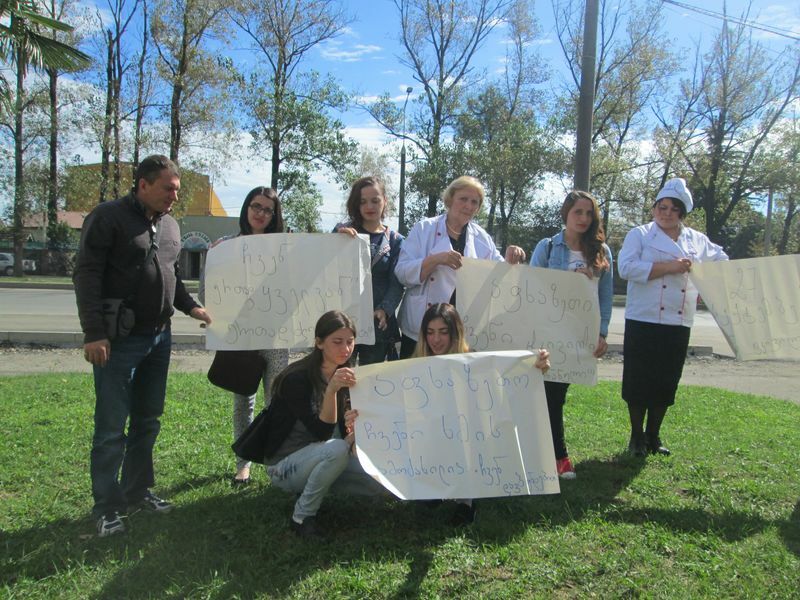 On April, 9, 2015 WFE volunteers joined the Abkhazian Government proposal at Imereti region and participated in charity event. 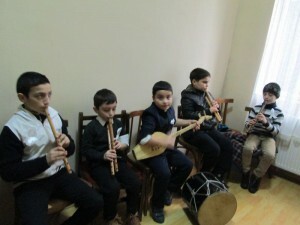 Within the event food packages were given to families of those killed in the war in Abkhazia, to large families with a lot of children, to vulnerable and internally displaced persons. 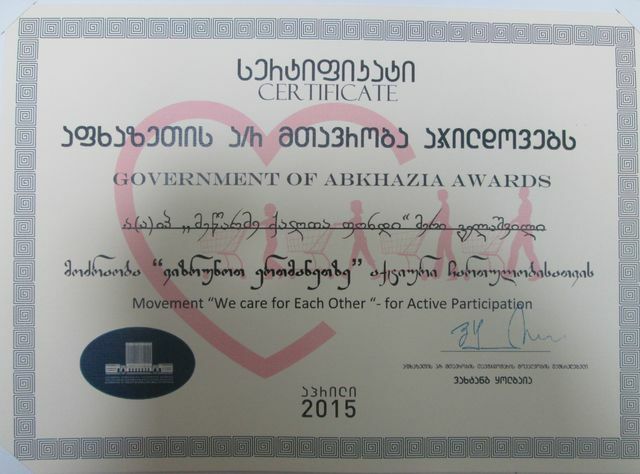 FWE was awarded the certificate by the Abkhazian government “to take care of each other” active paticipation. 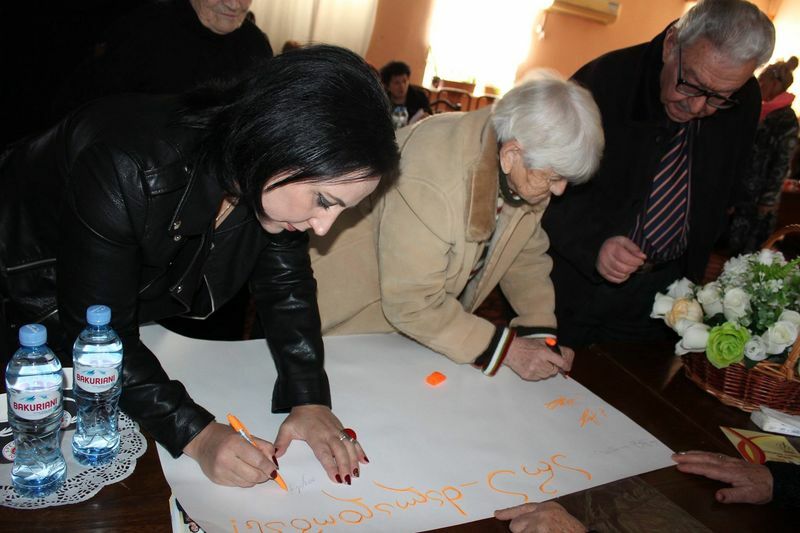 On March 2015 WFE volunteers joined the Abkhazian Government proposal at Imereti region and participated in charity event. 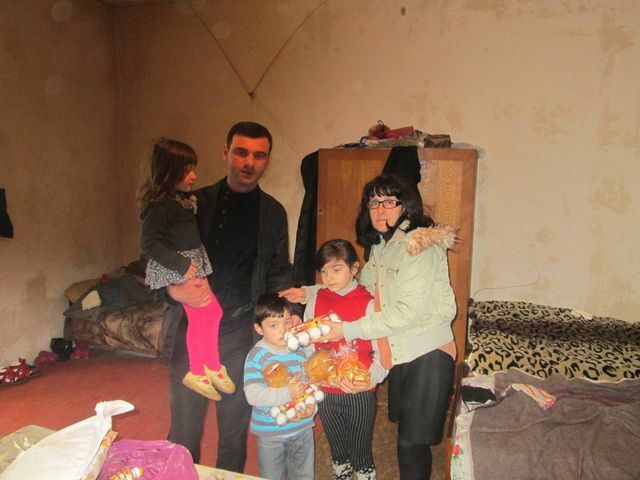 Within the event food packages were given to families of those killed in the war in Abkhazia, to large families with a lot of children, to vulnerable and internally displaced persons. The Ministry of Health has announced 2015 year of the Hepatitis C. “Georgia without hepatitis C” – is the title of the program, which is in action from January 14. Do not put at risk the health of its citizens! On 5 December 2014 meeting was held.With Poti professional college “phasis” students. 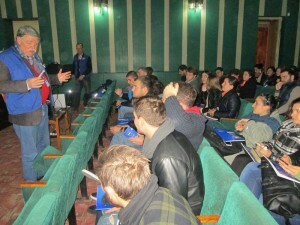 The meeting was attended by the students together with the lecturers. The meeting was attended by 50 people. 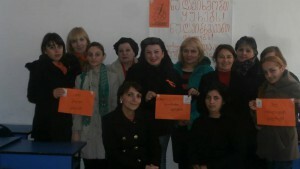 Lali Gvalia informed the students about the organization of violence against women on the 16-day campaign. The participants talked about the causes of violence, the results, the substance and its complications. At the end they all agreed that the problem of violence against women throughout our society, and everyone is contributing to this problem in its elimination. The meeting was held on December 5, 2014 news. 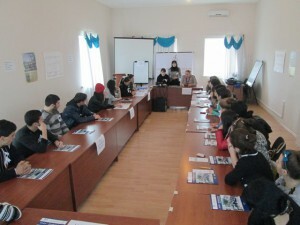 Poti Vocational College “The future”, where the causes of violence, prevent violence against women discussed “at the women’s school” The students and refugee women. Specific examples of the attendees brought from their everyday life and noted that it has bad influence being in violent environments, as well as the mother of an adolescent psychology. 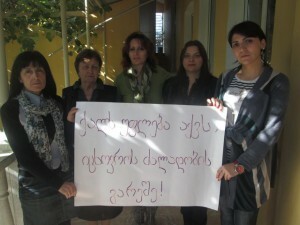 The women discussed the preventive measures that the state authorities to tackle the problem of violence. 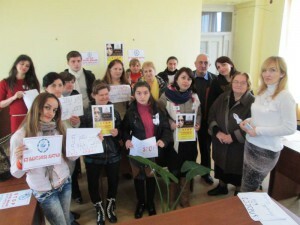 Violence against women within 16 days of the “Women Entrepreneurs “ informational meeting was held on December 4, 2014 Tsereteli University students. 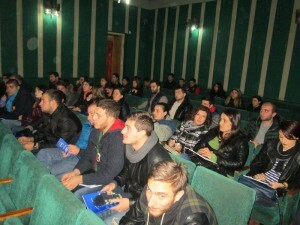 The meeting also took part in the European Union Monitoring Mission in Zugdidi EUMM- observers, they made ​​a presentation of the film, which is the mandate of the EU Monitoring Mission in Georgia and its relation to the campaigns portrayed. The meeting was attended by 40 students. 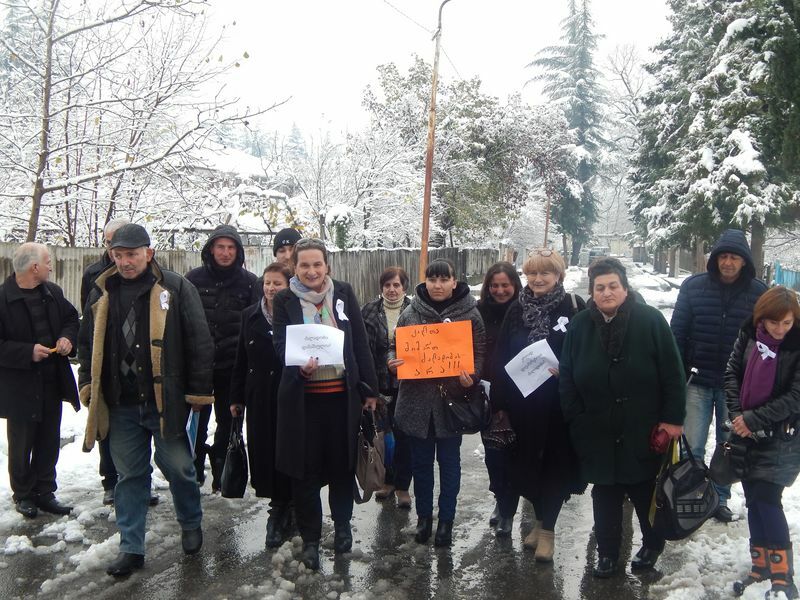 On December 3, 2014 against violence against women within the 16 days “on the Fund’s” The meeting of the representatives of the beneficiaries of the house for Thanksgiving. 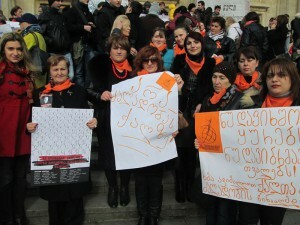 Organization of a 16-day campaign on violence against women and problems. 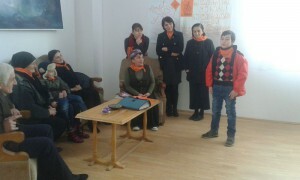 The participants condemned violence against women and violence against their poems and mini-monologues expressed attitude. 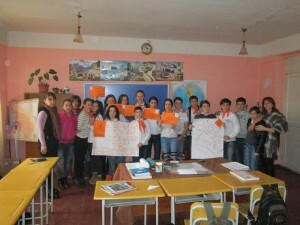 November 28, 2014 “on the Fund’s” 16 Days of Activism Against Gender Violence campaign, carried out in the 17th meeting of the 8th grade public school students. 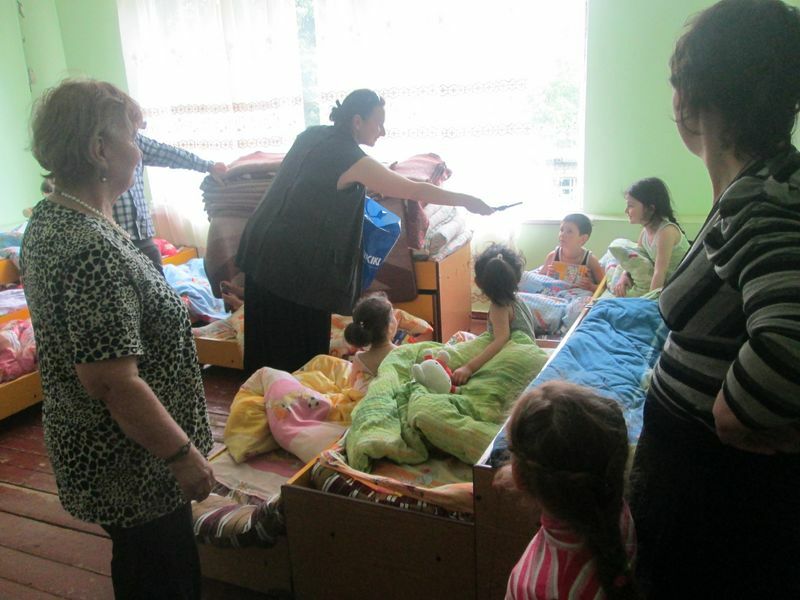 The “protection and assistance of victims of domestic violence to the law” and the changes in the alignment of the preventive means, which is implemented by the state to protect the rights of women and children. The meeting was attended by 25 students. 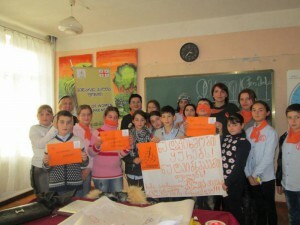 On November, 26 , 2014, , “Women Entrepreneurs Fund” was planned for the event: among the“16-days campaign to eliminate violence” E. kupharadze A. Chikhladze in 23 public school teachers and students met. Purpose of the meeting: ”Gender Equality and Prevention of Violence against Women” on information: the situation in Georgia, has been detected in cases of violence against women, violence in any forms and the measures that will prevent them. Afterwards, the students actively engaged in the discussion, held a mini group works, which were made ​​by representatives of the following groups. At the end of the summary of the topic, participants expressed their opinion about the irreconcilability of violence against women. On 25 November 2014, ”Women Entrepreneurs Fund” United Nations Population Fund (UNFPA), initiated by the 16-day campaign of violence against women in an hour-long demonstration. 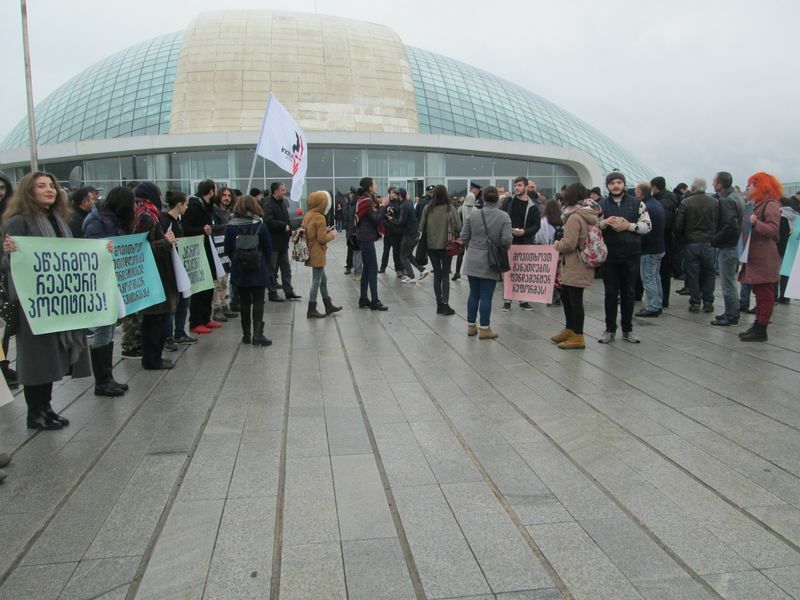 The protesters condemned the violence against women, women and called on everyone to unite in solidarity to support women’s rights and violence against women. “Women Entrepreneurs Fund” employees have signed the petition, which the undersigned urge the government to “realize the scope of the problem of violence and their responsibility in the fight against gender inequality. Take timely, efficient and cost-effective policies to eliminate violence against women and gender inequality “. 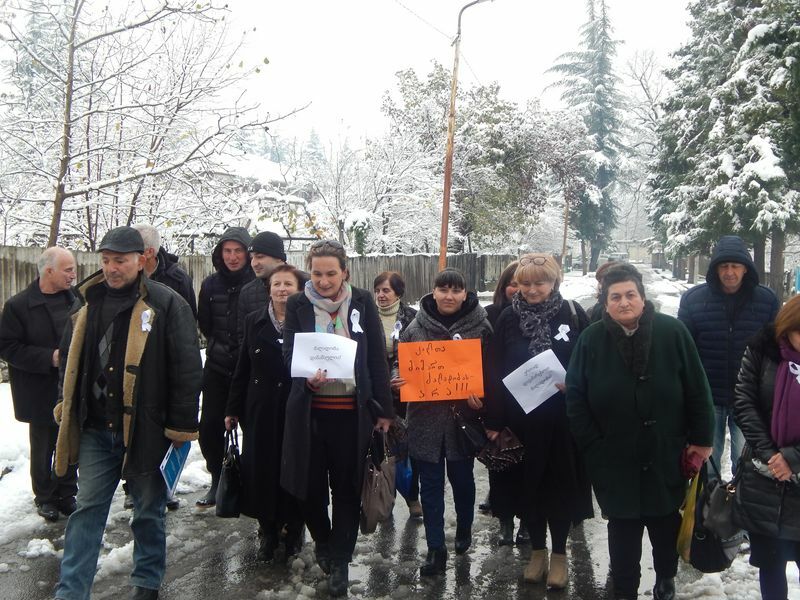 Causes of gender-based violence, legislative initiatives and concept of rehabilitation of domestic abusers were the issues discussed at the meeting held on December 6, 2013 at Kutaisi public college “Iberia” by the representatives of the Fund of Women Entrepreneurs. 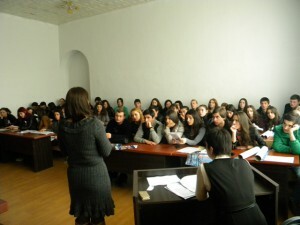 Students were actively involved in the discussion and expressed the necessity of such meetings to increase the awareness of the law of Georgia on “Prevention of Domestic Violence, Protection and Prevention and Assistance of Victims of Domestic Violence”. 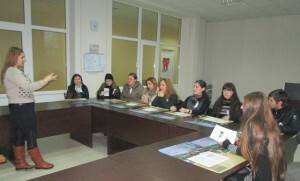 On December 5, 2013 an informational meeting was organized by the representatives of FWE for the students of Journalism and Philology School and Professional Training Centre of Tbilisi Open Teaching University. At the meeting held within the framework of 16 Days of Activism Against Gender Violence Campaign, the participants were aware of the causes and forms of gender violence and its prevention. The meeting was conducted in an interactive format with the students’ active participation. On December 3, 2013 another meeting was held with “National Training Center” students by the representatives of Fund of Women Entrepreneurs within the framework of 16 Days Campaign. 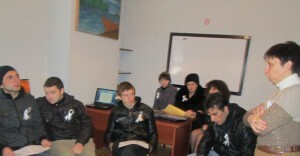 The meeting was about the causes of gender violence, prevention measures considered by the law. 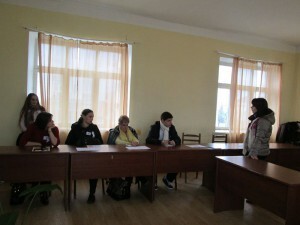 During the meeting students expressed satisfaction had been informed with the legislative innovatives considered in the bill of Georgia “Prevention of Domestic Violence, Protection and Prevention and Assistance of Victims of Domestic Violence”. 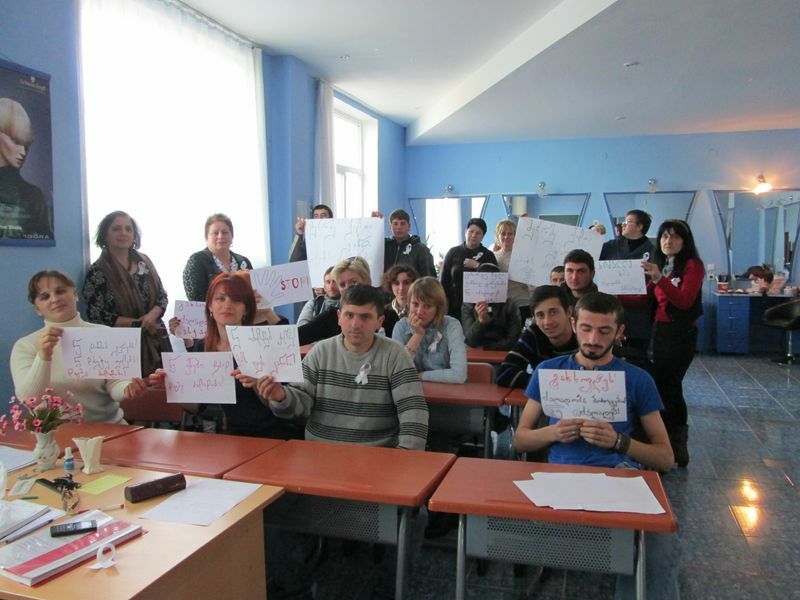 On November 29, 2013 an informational meeting, within the 16 Days Campaign was held with Akaki Tsereteli State University students. 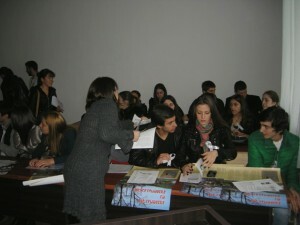 Representatives of the FWE informed 70 students about the domestic violence legislative issues, mechanism of violence prevention and about the legislative initiatives considered in the bill of Georgia “Prevention of Domestic Violence, Protection and Prevention and Assistance of Victims of Domestic Violence”. 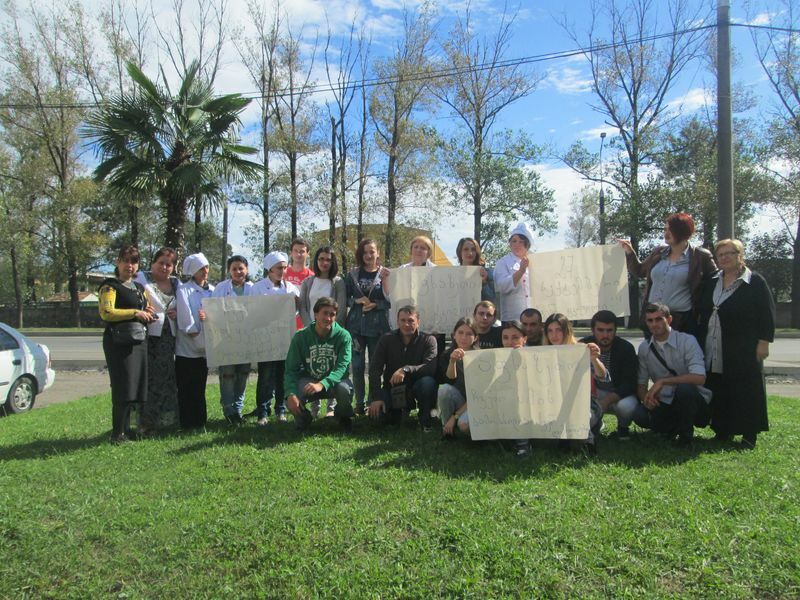 On November 26, 2013 a training in “Social Enterprise” was conducted in the collective centre “Deska”, in Kutaisi. 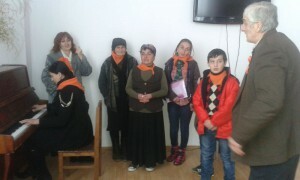 Before the training people, both IDPs and local ones living in Avangardi settlement were aware of 16 Days Activism Against Gender Violence Campaign. 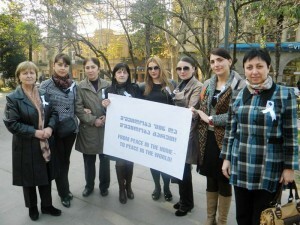 Fund of Women Entrepreneurs marked the first day (November 25) of the international campaign “16 Days of Activism Against Gender Violence’’ with an-hour silent action in the city center of Kutaisi near the Mayor’s office to support the initiative of the fund “Sukhumi”. 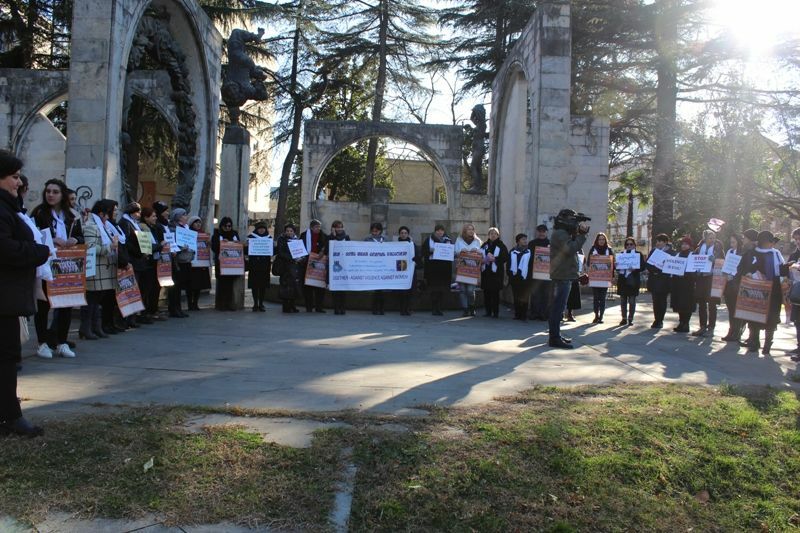 Through the action staff members and activists of the fund “Sukhumi” and Fund of Women Entrepreneurs as well as the representatives of NGOs working in Kutaisi protested the violence against women by posters and distributing informational materials among citizens. Fund of Women Entrepreneurs participated in the international network “Peace One Day” activities and is planning to celebrate Peace Day. The day was addicted to create a global peace capable of driving violence from our homes, schools and communities. 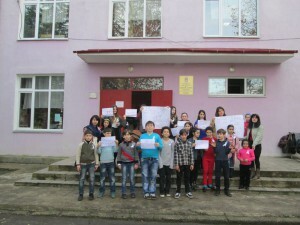 An interactive poll on the topic “Peace Day – a carpet of ideas’’ was held by FWE. Twenty-five women, both fund representatives and beneficiaries participated in the interactive. After the discussion, conducting women forum called “Women for peace’’ was regarded as the best idea which is arranged on September 21, 2013. The forum will be ended with the message to the world “There is no alternative to peace’’ with the signatures of all participants. Fund of Women Entrepreneurs is the active participants of the international campaign and every year FWE conducted tens of activities. 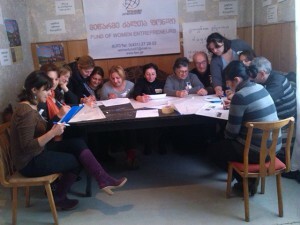 Professional college “Phazisi” and “school for middle-aged women” of Poti joined the Fund of Women Entrepreneurs within the 16-day campaign against women violence, which was opened on December 3, 2012. 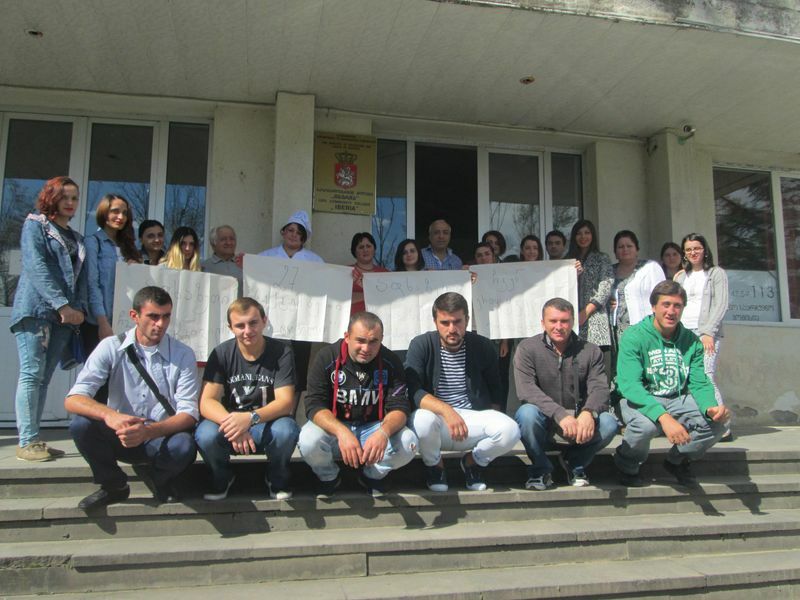 The main slogan of campaign “Peace at home – peace in the world” was picked up by the young girls, women and the teachers of professional college of Poti. 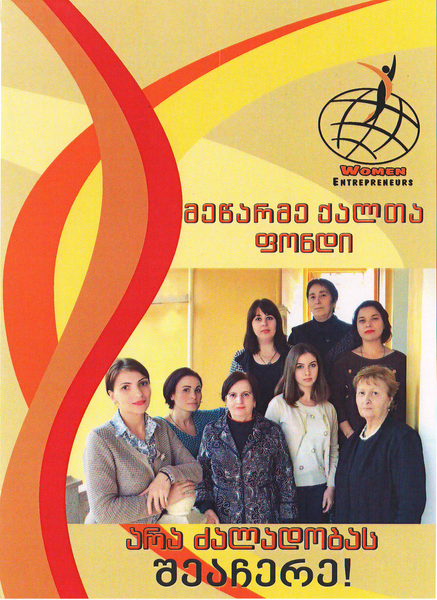 Fund of Women Entrepreneurs arranged an exhibition-conference on September 21, 2012. The event called “Sustainable Peace – Sustainable Future” was dedicated to the International Day of Peace. On this day, the FEW, as a member of the international network “Peace One Day” remembered the audience the importance and necessity of peace.